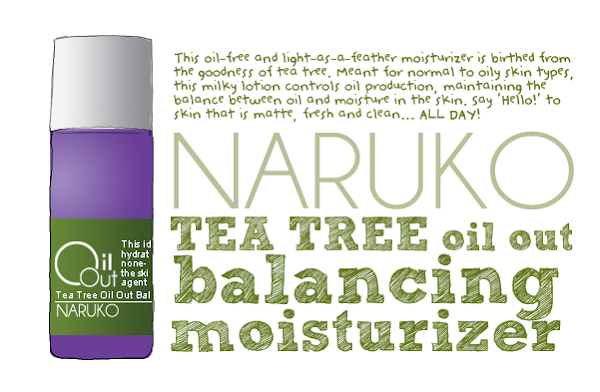 The Tea Tree Oil Out Skincare Range is one of the ten series that Naruko has. This series targets oily and blemish-prone skin specifically. It controls your oil production without being too aggressive and so, ensures that your skin does not dry out. Tea Tree Essential Oil forms the basis that this series is built upon. Tea tree oil is extracted from the leaves of the Melaleuca alternifolia, a plant native to New South Wales, Australia. Tea tree oil has long been used to treat coughs and colds. The leaves of the plant are usually soaked to make a remedy for skin ailments. The Tea Tree Oil Out Balancing Moisturizer is an oil-free, light-weight moisturizer. It promises to control your oil production without going overboard. And that means that oily skin will not turn into a Sahara desert. Instead, your skin achieves some sort of a Nirvana when a balance is struck between the oil and moisture levels in your skin and all your pores are unclogged and refined. This moisturizer can be used before makeup to ensure a complexion that is fresh and clean all day! Zinc PCA, Tea Tree and Mint Essential Oils, Natural Wood Fiber and Micro-Crystalline Silicon Powder work together to control oil production. Lentil Seed is responsible for increasing your skin's metabolism and the presence of Collagen and Hyaluronic acid ensure that your skin is hydrated and as free as possible from the clutches of hyperpigmentation. 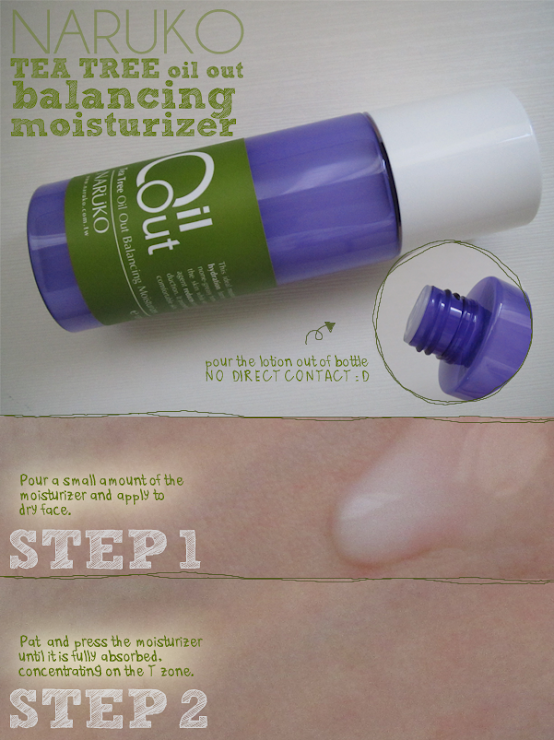 The Tea Tree Oil Out Balancing Moisturizer resides in a 120ml plastic, purple bottle. The bottle is sturdy. The cap unscrews to reveal a nozzle from which the moisturizer is poured out from. Again, there is no direct contact with the rest of the moisturizer when you are getting out the amount that you need. :D One thing though is that the radius of the nozzle is quite large so some of the moisturizer is left on it after dispensing. Do clean it off to prevent using any 'old moisturizer' on your next application! The moisturizer takes the form of a slightly milky lotion. 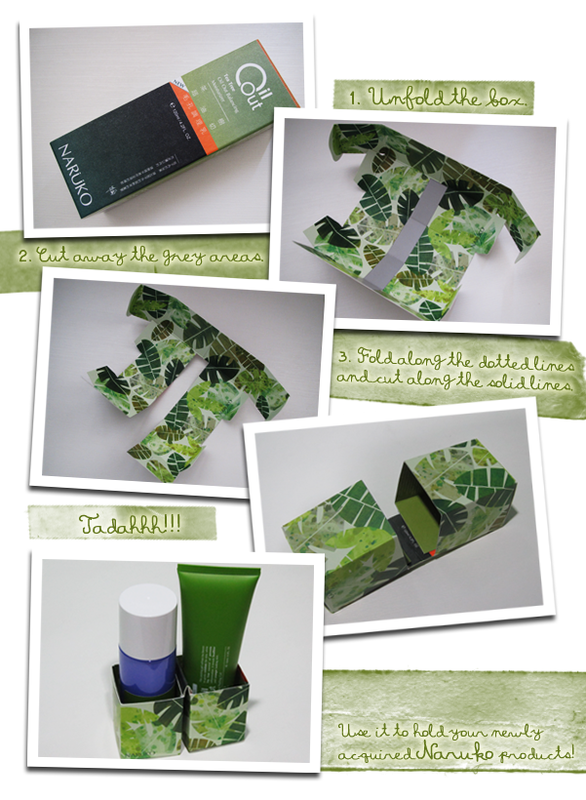 Just like the Tea Tree Oil Out Peeling Gel, it has a very strong tea tree scent. 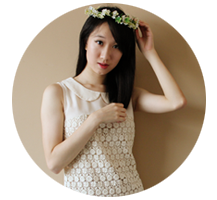 There is an almost-immediate cooling effect upon application because of the Mint essential oil. Incredibly refreshing, I must say! Naruko's website suggests pouring the moisturizer on to a cotton pad, wiping the entire face with it in circular motions and then, ending the application by patting the remaining moisturizer in. When I did that, however, I found that most of the moisturizer just remained 'locked' in my fluffy cotton pads. Naruko did suggest using their Facial White Illuminating Cotton Pads. But since I haven't got them, what I do is that I just pour some of the moisturizer on my hands, and pat it into my face. The moisturizer sinks into my skin easily and quickly, leaving a beautiful matte finish. My nose remains matte for a good 3 hours before any shine starts to show up. It leaves my skin feeling smooth, refreshed and very, very matte! There is absolutely no residue of it left on the skin, so there is no yucky layer sitting on your skin and your skin certainly will not squirm with discomfort. The moisturizer is completely absorbed into your skin! This moisturizer will be a godsend to people with oily skin, as this is specifically made for them. Those whose skin is suffering from a drought will need to look somewhere else. The moisturizer was too harsh for my dry cheeks, so I use this just on my oily T-zone area. And like all other Naruko products, the box which the Tea Tree Oil Out Balancing Moisturizer comes in can be made into a container to hold your new Naruko products! :D Yay to environmentally-friendly brands!